A perfectly spooky tale for a spooky time of year, and entertaining for the whole family. It's a simple tale, this one, on the surface. Madlyn and Rollo's parents are off in New York, because their father has taken a badly-needed commission. 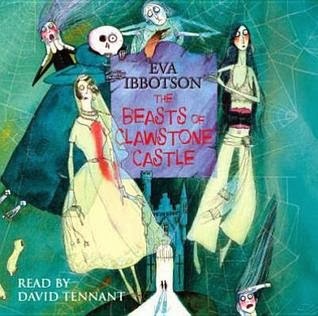 They are packed off to spend the summer with their Great-Uncle George and Great-Aunt Emily at an old castle in the north named Clawstone. Once there, it is apparent that things are not going well; the neighbouring castle, Trembello Towers, is drawing all the local visitors, and there is no money for the upkeep of the castle, the grounds, or most importantly, the herd of unique, wild white cattle who inhabit the grounds. Madlyn and Ned, one of the local children, come up with an idea to draw visitors back to Clawstone with the help of some rather unusual entertainers. This is very much a children's book, in that the villains are villainous and unpleasant, the good characters are good beyond reproach, and there isn't too much in between. The characterization is enough, but not deep. But the writing is solid and the plot is, while occasionally completely ridiculous in a fun way, well-executed. And there are deeper issues here that would make for great discussion with kids. They are never belaboured, but it is not as if Ibbotson was ignoring them; they are an integral part of the plot, but this is a short book, and so if the plight of refugees in the UK is never investigated deeply it's not because the seriousness of the problem isn't recognized. It's just not the point of the story. There are other stories that deal with that. Where things do get a bit sketchy is with a few minor plot threads towards the end that do odd things. Why did the banshees bother to come to Black Scar Island with Great-Uncle George if nothing was going to be said about them on that visit? What was the point of their presence? Did I miss it because I was listening to an audiobook? Was it just intended to be amusing at that moment? (I don't think this counts as a spoiler, at least not a major one, unless I really did miss something important.) It was just such a strange oversight, in a book that otherwise seemed to tie up the ends rather neatly if not always in the way one expected. I was confused enough about it that I actually paused the disc once I realized nothing more was going to be said about them. Thrown out of the story. I am of the Chekhov school - if you are going to have a banshee or three in the back of the car, those banshees had better be used in the plot. Otherwise they just confuse me. The audio is excellent. It's David Tennant doing the reading, so how can it not be? He's got a wonderful reading voice, and he does the character's voices well, and one never feels like one is being spoken down to, which is always a turnoff for me with kids' audiobooks. I'd love to do this book with one of my child-parent book clubs, because of the fact that I think there is meat to discuss but also just a wonderful, entertaining, spooky but not too spooky story that would appeal to all ages. Much thanks to Darla for bringing it to my attention, lo those many years ago.